SEC (SECurity phase). This contains all the CPU initialisation code from the cold boot entry point on. It’s job is to set the system up far enough to find, validate, install and run the PEI. PEI (Pre-Efi Initialization phase). This configures the entire platform and then loads and boots the DXE. DXE (Driver eXecution Environment). This is where the UEFI system loads drivers for configured devices, if necessary; mounts drives and finds and executes the boot code. After control is transferred to the boot OS, the DXERuntime stays resident to handle any OS to UEFI calls. This all sounds very simple (and very like the way an OS like Linux boots up). However, there’s a very crucial difference: The platform really is completely unconfigured when SEC begins. In particular it won’t have any main memory, so you begin in a read only environment until you can configure some memory. C code can’t begin executing until you’ve at least found enough writable memory for a stack, so the SEC begins in hand crafted assembly until it can set up a stack. On all x86 processors (including the Quark), power on begins execution in 16 bit mode at the ResetVector (0xfffffff0). As a helping hand, the default power on bus routing has the top 128KB of memory mapped into the top of SPI flash (read only, of course) via a PCI routing in the Legacy Bridge, meaning that the reset vector executes directly from the SPI Flash (this is actually very slow: SPI means Serial Peripheral Interface, so every byte of SPI flash has to be read serially into the instruction cache before it can be executed). The hand crafted assembly clears the cache, transitions to Flat32 bit execution mode and sets up the necessary x86 descriptor tables. It turns out that memory configuration on the Quark SoC is fairly involved and complex so, in order to spare the programmer from having to do this all in assembly, there’s a small (512kB) static ram chip that can be easily configured, so the last assembly job of the SEC is to configure the eSRAM (to a fixed address at 2GB), set the top as the stack, load the PEI into the base (by reconfiguring the SPI flash mapping to map the entire 8MB flash to the top of memory and then copying the firmware volume containing the PEI) and begin executing. Usually the PEI code is located by the standard Flash Volume code of UEFI and the build time PCDs (Platform Configuration Database entries) which use the values in the Flash Definition File to build the firmware. However, the current Quark Platform package has a different style because it rips apart and rebuilds the flash volumes, so instead of using PCDs, it uses something it calls Master Flash Headers (MFHs) which are home grown for Quark. These are a fixed area of the flash that can be read as a database giving the new volume layout (essentially duplicating what the PCDs would normally have done). Additionally the Quark adds a non-standard signature header occupying 1k to each flash volume which serves two purposes: For the SECURE_LD case, it actually validates the volume, but for the three items in the firmware that don’t have flash headers (the kernel, the initrd and the grub config) it serves to give the lengths of each. This is a really big deal for most embedded systems because the amount of flash available is really limited. The Galileo board is nice because it supplies 8MB of flash … which is huge in embedded terms. All flash is divided into Flash Volumes1. If you look at OVMF for instance, it builds its flash as four volumes: Three for the three SEC, PEI and DXE phases and one for the EFI variables. In EdkII, flash files are built by the flash definition file (the one with a .fdf ending). Usually some part of the flash is compressed and has to be inflated into memory (in OVMF this is PEI and DXE) and some are designed to be execute in place (usually SEC). If you look at the Galileo layout, you see that it has a big SEC phase section (called BOOTROM_OVERRIDE) designed for the top 128kb of the flash , the usual variable area and then five additional sections, two for PEI and DXE and three recovery ones. (and, of course, an additional payload section for the OS that boots from flash). For embedded devices (and even normal computers) recovery in the face of flash failure (whether from component issues or misupdate of the flash) is really important, so the Galileo follows a two stage fallback process. The first stage is to detect a critical error signalled by the platform sticky bit, or recovery strap in the SEC and boot up to the fixed phase recovery which tries to locate a recovery capsule on the USB media2. The other recovery is a simple copy of the PEI image for fallback in case the primary PEI image fails (by now you’ll have realised there are three separate but pretty much identical copies of PEI in the flash rom). One of the first fixes that can be made to the Quark build is to consolidate all of these into a single build description. One of the first things I discovered when trying to update the UEFI version to something more modern is that the size of the PEI phase overflows the allowed size of the firmware volume. This means either redo the flash layout or compress the PEI image. I chose the latter and this is the story of how it went. And now debugging works in the SEC phase! On the current quark build, the SEC phase is designed to be installed into the bootrom from 0xfffe 0000 to 0xffff ffff. This contains a special copy of the reset vector (In theory it contains the PEI key validation for SECURE_LD, but in practise the verifiers are hard coded to return success). The next oddity is that the stage1 image, which should really just be the PEI core actually contains another boot from scratch SEC phase, except this one is based on the standard IA32 reset vector code plus a magic QuarkSecLib and then the PEI code. This causes the stage1 bring up to be different as well, because usually, the SEC code locates the PEI core in stage1 and loads, relocates and executes it starting from the entry point PeiCore(). However, quark doesn’t do this at all. It relies on the Firmware Volume generator populating the first ZeroVector (an area occupying the first 16 bytes of the Firmware Volume Header) with a magic entry (located in the ResetVector via the magic string ‘SPI Entry Point ‘ with the trailing space). The SEC code indirects through the ZeroVector to this code and effectively re-initialises the stack and begins executing the new SEC code, which then locates the internal copy of the PEI core and jumps to it. This entry was posted in Embedded, UEFI on 10 February 2015 by jejb. At one of the Intel Technology Days conferences a while ago, Intel gave us a gift of a Galileo board, which is based on the Quark SoC, just before the general announcement. The promise of the Quark SoC was that it would be a fully open (down to the firmware) embedded system based on UEFI. When the board first came out, though, the UEFI code was missing (promised for later), so I put it on a shelf and forgot about it. Recently, the UEFI Security Subteam has been considering issues that impinge on embedded architectures (mostly arm) so having an actual working embedded development board could prove useful. This is the first part of the story of trying to turn the Galileo into an embedded reference platform for UEFI. The first problem with getting the Galileo working is that if you want to talk to the UEFI part it’s done over a serial interface, with a 3.5″ jack connection. However, a quick trip to amazon solved that one. 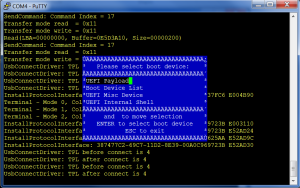 Equipped with the serial interface, it’s now possible to start running UEFI binaries. Just using the default firmware (with no secure boot) I began testing the efitools binaries. Unfortunately, they were building the size of the secure variables (my startup.nsh script does an append write to db) and eventually the thing hit an assert failure on entering the UEFI handoff. This led to the discovery that the recovery straps on the board didn’t work, there’s no way to clear the variable NVRAM and the only way to get control back was to use an external firmware flash tool. So it’s off for an unexpected trip to uncharted territory unless I want the board to stay bricked. The flash tool Intel recommends is the Dediprog SF 100. These are a bit expensive (around US$350) and there’s no US supplier, meaning you have to order from abroad, wait ages for it to be delivered and deal with US customs on import, something I’ve done before and have no wish to repeat. So, casting about for a better solution, I came up with the Bus Pirate. It’s a fully open hardware component (including a google code repository for the firmware and the schematics) plus it’s only US$35 (that’s 10x cheaper than the dediprog), available from Amazon and works well with Linux (for full disclosure, Amazon was actually sold out when I bought mine, so I got it here instead). The Bus Pirate comes as a bare circuit board (no case or cables), so you have to buy everything you might need to use it extra. I knew I’d need a ribbon cable with SPI plugs (the Galileo has an SPI connector for the dediprog), so I ordered one with the card. The first surprise when the card arrived was that the USB connector is actually Mini B not the now standard Micro connector. I’ve not seen one of those since I had an Android G1, but, after looking in vain for my old android one, Staples still has the cables. The next problem is that, being open hardware, there are multiple manufacturers. They all supply a nice multi coloured ribbon cable, but there are two possible orientations and both are produced. Turns out I have a sparkfun cable which is the opposite way around from the colour values in the firmware (which is why the first attempt to talk to the chip didn’t work). The Galileo has diode isolators so the SPI flash chip can be powered up and operated independently by the Bus Pirate; accounting for cable orientation, and disconnecting the Galileo from all other external power, this now works. Finally, there’s a nice Linux project, flashrom, which allows you to flash all manner of chips and it has a programmer mode for the Bus Pirate. Great, except that the default USB serial speed is 115200 and at that baud rate, it takes about ten minutes just to read an 8MB SPI flash (flashrom will read, program and then verify, giving you about 25 mins each time you redo the firmware). Speeding this up is easy: there’s an unapplied patch to increase the baud rate to 2Mbit and I wrote some code to flash only designated areas of the chip (note to self: send this upstream). The result is available on the OpenSUSE build service. The outcome is that I’m now able to build and reprogram the firmware in around a minute. By now this is two weeks, a couple of hacks to a tool I didn’t know I’d need and around US$60 after I began the project, but at least I’m now an embedded programmer and have the scars to prove it. Next up is getting Secure Boot actually working …. 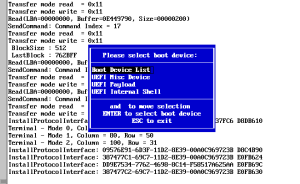 This entry was posted in Embedded, UEFI on 25 January 2015 by jejb.